We have been utilizing The Creative Curriculum since July 2000 finding that its emphasis on free choice, child-initiated play, individualization and environments to support learning fit our school’s philosophy. 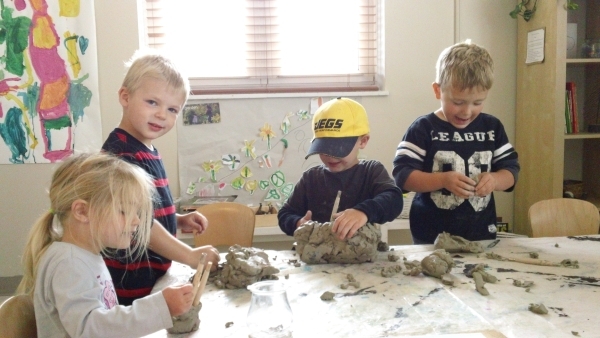 As a Reggio Emilia inspired school, the Creative Curriculum integrates well with the Reggio Approach. Children, along with adults, grow in knowledge through exploration of their physical environment and interactions with people. We view each child with respect knowing he/she is a capable, learning individual. The Creative Curriculum and the Reggio Approach support this view. The Creative Curriculum for Infants and Toddlers and Preschool is “based on the theories and research that inform decision making in the early childhood field – the work of Piaget, Maslow, Erikson, and Smilansky.” Recently, the approach has incorporated “the theories of Vygotsky and Gardner as well as new information about learning and the brain and resiliency” (The Creative Curriculum for Preschool, Trister, Colker and Heroman, p. xiv). In addition to Creative Curriculum, we are inspired by the Reggio Emilia Approach. This early childhood approach from Reggio Emilia, Italy, first gained media recognition in the United States in 1991 and has grown in acclaim and has inspired educators throughout the world. Howard Gardner states in The Hundred Languages of Children that the Reggio System is “a collection of schools for young children in which each child’s intellectual, emotional, social, and moral potentials are carefully cultivated and guided. The principal educational vehicle involves youngsters in long-term engrossing projects, which are carried out in a beautiful, healthy, love-filled setting (Edwards, Gandini, and Forman, p x).”Loris Malaguzzi, an Italian educator who became interested in the construction of a new school after World War II, dedicated his life to promoting Reggio schools, defending the rights of children, and building a learning community among educators, parents and children. The Reggio philosophy has stood the test of time and has been shared with international audiences each year. To read more information about the Reggio Emilia philosophy please visit the NorthAmerican Reggio Alliance Website or the Reggio Children Website.